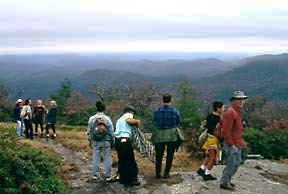 Members of the North Carolina Bartram Trail Society at Scaly Mountain, Macon County. At the site of old Fort Prince George in South Carolina, Bartram had hoped to obtain an Indian guide for the remainder of his journey through Cherokee country. On the opposite side of the river was the old site of Keowee, formerly chief town of the lower Cherokees, but at the time of Bartram’s trip, uninhabited. At the site of the fort were several dwellings inhabited by white people, the old fort itself, serving as a trading house. After spending two or three days here without having succeeded in obtaining a guide, Bartram determined to continue his journey alone. He left this place about May 19, 1775,(86) traveling on horseback (as he had throughout most of his trip) through northern parts of present-day South Carolina and Georgia. (87) Toward evening of this first night out of old Fort Prince George, Bartram sighted an unoccupied Indian hunting cabin where he spent the night, grateful for the shelter after having been caught in a torrential thunder storm during the afternoon. The next day, he reached the waters of the Little Tennessee River. He followed down it “pursuing my serpentine path, through and over the meadows and green fields and crossing the river.”(88) After traveling some miles down the river, he came to “a very beautiful creek, which flowed into the river just before me; but now behold, high upon the side of a distant mountain overlooking the vale, the fountain of this brisk flowing creek; the unparalleled water fall appears as a vast edifice with crystal front, or a field of ice lying on the bosom of the hill.” This was Estatoah Falls. (89) Bartram was nearing North Carolina. Here, Bartram was forced to ford the river “which was greatly swollen by the floods of rain that fell the day before.”(90) The river’s volume was such that he “was obliged to swim two or three yards at the deepest channel of it, and landed safely on the banks of a fine meadow, which lay on the opposite shore, where I immediately alighted and spread abroad on the turf my linen, books and specimens of plants, &c. to dry, turned out my steed to graze and then advanced into the strawberry plains to regale on the fragrant, delicious fruit.”(9l) It is at about this point that he entered present-day North Carolina. The road which Bartram was following led into the town of Whatoga, “up to the council house, which was a very large dome or rotunda, situated on the top of an ancient artificial mount,”(97) and here the road ended. Bartram was at a loss as to which way to proceed. While deciding what to do next, he observed an Indian man beckoning to him from the door of his house several hundred yards distant. This man, the head of the village, received Bartram hospitably, had his horse cared for, and provided “a refreshing repast, consisting of sodden venison, hot corn cakes &c. with a pleasant cooling liquor made of homony well boiled, mixed afterwards with milk.”(98) After the meal, the chief brought out tobacco and a special pipe with a long (four foot) stem, “sheathed in a beautiful speckled snake skin and adorned with feathers and strings of wampum.”(99) When it came time for Bartram to continue his trip, his host gave him directions to Cowee and accompanied him about two miles on the way. The town was not far (about seven miles from Whatoga) and Bartram soon arrived there. This was about May 21, 1775. Of Cowee he wrote: “This settlement is esteemed the capital town; it is situated on the bases of the hills on both sides of the river, near to its bank, and here terminates the great vale of Cowe, exhibiting one of the most charming natural mountainous landscapes perhaps anywhere to be seen.”(l00) The town of about 100 dwellings was situated at the mouth of the Cowee Creek (on the site of today’s West’s Mill, North Carolina). On the return trip, Bartram again passed through Cowee, and at that time described the council house. “The council or town-house is a large rotunda, capable of accommodating several hundred people; it stands on the top of an ancient artificial mount of earth, of about twenty feet perpendicular, and the rotunda on the top of it being above thirty feet more, gives the whole fabric an elevation of about sixty feet from the common surface of the ground. But it may be proper to observe, that this mount on which the rotunda stands, is of a much ancienter date than the building, and perhaps raised for another purpose.”(l0l) There is today a rise on the west side of the river which locally is known as the mound on which was situated the council house. Not far distant, in rock outcroppings, are grinding holes, or hominy holes, where the indians ground their corn. Descending the other side of the mountain, they came on the waters of Alarka Creek. Here, in a verdant meadow, the trader had many fine horses pastured. each year, as they matured, he sent a group to Charleston for sale. Continuing a bit further, the men encountered a group of Cherokee women gathering strawberries. The event produced one of Bartram’s most vivid descriptions. They recrossed the Cowee range west of their earlier crossing(l06) and arrived back in Cowee by evening. From Burningtown Gap the trail led down the west side of the Nantahala range to the vicinity of present day Kyle. This could have been along the route followed by the present road down Ben Creek or along Split Whiteoak Ridge. The “considerable rapid brook” he descended was probably Whiteoak Creek. From Whiteoak Creek the trail would have been up Bateman Branch, through Bateman Gap, across the head of Long Branch and through Otter Gap to Otter Creek. Thus he proceeded “several miles over ridges and grassy vales, watered with delightful rivulets.”112 Somewhere in this area he spent the night of May 24th. The next day, after “proceeding on eight or ten miles, generally through spacious high forests and flowery lawns”(113) he came to a large creek or riverundefinedno doubt, the Nantahala. His route to this point would have been across the ridge from Otter Creek by way of present-day Briertown to Partridge Creek. Then up the left fork of Partridge Creek and across a gap to the head of Queens Creek. From there he probably followed the route of the present Winding Stairs Road to the Nantahala River near present- day Beechertown. A highway marker not far from here commemorates Bartram’s meeting with the great Cherokee Chief, Attakullakulla. Bartram records that, soon after crossing the river, he saw a company of Indians, mounted on horseback, coming down the mountain in his direction. As they came nearer, he saw a chief at their head whom he correctly assumed to be Attakullakulla. (114) Their meeting was friendly. Attakullakulla made inquiry about John Stuart, Superintendent of Indian Affairs with headquarters in Charleston, whose life had been saved by Attakullakulla at the time of the fall of Fort Loudon and whom Attakullakulla was then on his way to see. When they parted, Bartram continued on up the mountain, passing through Tululah Gap and following a course generally down Tululah Creek. He spent the night of May 25th somewhere in the vicinity of Sweetgum. The next morning, May 29, Bartram set out on the return trip and in two days (on the evening of May 30) arrived back at Keowee. The next day Bartram proceeded up the west side of the Cape Fear River, “rested two or three days at the seat of F. Lucas, Esq.” in southern Bladen County, and then continued on to his uncle’s plantation, “Ashwood” (on the east bank of the river about five miles northeast of Council, Bladen County). Bartram had spent more than seven years living at his uncle’s property “on the high banks of the river”(118) and knew it well. His vivid description of the site in Part Three of the Travels reflects his fondness for Ashwood. It is regrettable that the house no longer stands today. Leaving his late uncle’s plantation for the last time, Bartram “continued up the west side of the river”(119) passing through present-day Elizabethtown and Tarheel, but between Dublin and the river. From Cambellton (Fayetteville) the route probably went north-northwest through or near present Manchester, Spout Springs, Jonesboro, Sanford and Pittsboro, across Cane Creek in extreme southern Alamance County. From the Quakers Meeting House above the creek, Bartram traveled northeast (perhaps along the old Woody’s Ferry Road) to Hillsboro, Orange County, and Oxford, Granville County. He left the state by crossing the Roanoke River into Virginia somewhere between Island and Nutbush Creeks. It was, in his own words, “the hoary frigid season”(120) or December, 1776..
84. See: Francis Harper, "William Bartram and the American Revolution," Proceedings of the American Philosophical Society, Vol. 97, No. 5, October 1953; and Naturalist’s Edition, op. cit., p. 416. 85. For this account of Bartram’s 1775 trip into western North Carolina, the Bartram Trail Conference is indebted to Rowell D. Bosse and Charles F. Moore for their Technical Study, "The Probable Route of William Bartram’s Travels in North Carolina," 1978. 86. In his journal, Bartram gives the year of this journey as 1776. Apparently it actually was made in 1775. For a discussion of this, see Harper, Naturalist's Edition, op. cit., p. 380. As to the exact day of the month that Bartram arrived at or departed from a particular point, authorities are frequently in disagreement. This is because Bartram does not always give the exact number of days spent at a place nor the date of departure. 87. Bartram’s route, as presented here, would have been along the lower Cherokee path to the overhill towns. Mr. Harry R. Wright, Mayor of Highlands, North Carolina (to whom the Bartram Trail Conference is indebted for assistance), is of the opinion that at this time Bartram was following the upper or northern Cherokee path to the overhill towns. This path would have taken him across the Chattooga River at Burrell’s Ford and up Hale Ridge, entering North Carolina near Commissioner's Rock. (See map by Margaret Mills Seaborn, 1974.) His route then would have been down Middle Creek to the Little Tennessee River. In this case, it would have been one of the falls on this creek which so impressed Bartram, rather than Estatoah Falls. 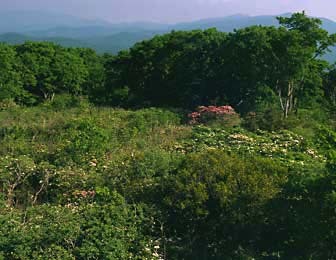 This view seems to gain some support from Wilburn, who says that Bartram climbed up and over the southwest corner of the Highlands Plateau, though he thinks that Bartram’s course was down Mud Creek. Harper favors the lower or southern path, as presented here. 88. Bartram’s Travels, p. 346, Harper, p. 219. 89. Ibid., p. 347, Harper, p. 220. 90. Ibid. Bartram does not say so, but indications are that the crossing was from east to west. Harper shares this opinion. 91. Bartram’s Travels, op. cit., p. 347, Harper, p. 220. 92. Ibid., p. 348, Harper, p. 220. 94. David H. Corkran, "The Asheville Citizen-Times," November 22, 1953. 95. Bartram’s Travels, op. cit., p. 350, Harper, p. 221. 96. Bartram does not indicate which side of the river Whatoga was on, but the preponderance of evidence seems to place it on the west side. Some early maps do show it on the east side. Harper speculates that, like Cowee, it may have occupied both banks. Nucasse was on the west side of the river, and if it had been necessary for Bartram to cross, it seems likely that he would have so indicated. 97. Bartram’s Travels, op. cit., p. 350, Harper, p. 221. 98. Ibid., p. 351, Harper, p. 222. 100. Ibid., pp. 352–353, Harper, p. 223. 101. Ibid., p. 367, Harper, p. 232. 102. There is nothing in the Travels to show whether this crossing was from west to east or in the other direction. Harper evidently thinks that the crossing was from east to west, as he indicates a course for the afternoon excursion which took Bartram and the trader up Rose Creek, across Burningtown Creek four or five miles above its mouth, the horse stamp near the mouth of Parrish Creek, and the return by way of the Parrish community. Wilburn favors a route almost diametrically opposite. 103. Bartram’s Travels, op. cit., p. 354, Harper, p. 224. 104. No doubt Bartram meant Cowee. Harper, pp. 224–225. 105. Bartram’s Travels, op. cit., pp. 354–355. 106. Ibid., pp. 356-358, Harper, pp. 225–226. 107. Both Harper and Wilburn think that Bartram went up Iotla Creek and through Iotla Gap. The Jore village was about four miles to the northeast of Nequasse and a mile or two from Wattoga (Whatoga). (See: David H. Corkran, ”Asheville Citizen-Times,” November 29,1953; and John H. Goff, "The Georgia Mineral Newsletter," date N/A). If this is true, Harper has placed this village entirely too far west. 108. Wilburn thinks that it was at Iotla Gap that Galahan took the trail back to Cowee. The route to Parrish Gap seems to agree more closely with Bartram's description of the terrain. Harper thinks that it was in the Wayah Creek valley that Bartram and Galahan parted. This does not seem a logical place for a trail from Cowee to come in on the right, according to Bosse and Moore. 109. Bartram’s Travels, p. 362, Harper, p. 229. 110. Harper thinks that Bartram crossed through Wayah Gap. The Burningtown Gap route is suggested by Messrs. Bosse and Moore based on their own field research; see Harper, Naturalist’s Edition, op. cit. 111. Bartram’s Travels, op. cit., p. 362, Harper, p. 229. 112. Ibid., p. 364, Harper, p. 230. 114. 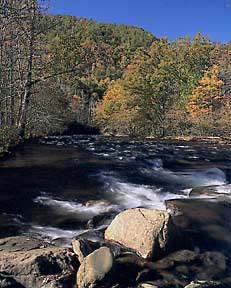 Harper thinks that Bartram crossed the Nantahala River in the vicinity of Aquone and that it was between there and Old Road Gap that he met Chief Atakullakulla; see Harper, Naturalist's Edition, op. cit. 115. It is Harper’s opinion that the point where Bartram turned back was in the Junaluska Creek valley not far from the present-day town of Andrews; Ibid. 116. See: Bartram’s Travels, op. cit., pp. 369–371, Harper, pp. 233–234. 117. Ibid., p. 473, Harper, p. 299 and pp. 419–421. 118. Ibid., p. 474, Harper, p. 300. 119. Ibid., p. 476, Harper, p. 302. 120. Ibid., p. 479, Harper, p. 303.